Imagine being a young child and witnessing a strange, eerie spacecraft crash land in front of your eyes. 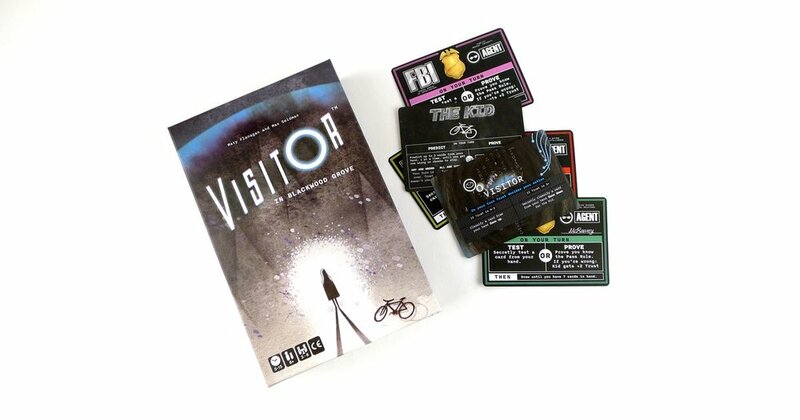 In Visitor in the Blackwood Grove, Federal Agents have tracked the alien space ship but are unable to make any communication because of an intense forcefield surrounding the ship. The alien, or Visitor, will only communicate with the Kid. The Visitor has developed a rule that will allow certain objects to pass through the forcefield. The Agents are also trying to determine the rule in hopes to take over the ship. There are three possible win conditions, the Kid figures out the Visitors rule and both players win, one Agent determines the rule and individually wins, or the Visitor runs out of clues to share which allows all Agents to take over the ship and claim victory. The game begins with each player choosing a roll, one Kid, one Visitor and the remaining players are Agents. Turns vary slightly depending on the roll of the player. Visitor Turn: If 2 of fewer trust has been established between the Kid and the Visitor, the Visitor chooses one card from their hand and classifies it face up either inside or outside the forcefield depending on how the object applies to the rule. If more than 2 trust has been established, the Visitor chooses a card from their hand, secretly shows it to the Kid and classifies the card face down. Kid Turn: The Kid must choose between predicting objects one by one until one guess is wrong, or proving the pass rule. Agent Turn: Test one object from the Agent's hand by secretly showing it to the Visitor. The Visitor will classify the card face down. The Agents can also choose to prove the pass rule. The pass rule for the both Kid and Agents is done by turning over the top four cards of object deck. The cards are placed in a line. The Visitor uses a screen to keep hidden whether the item pass or fail the rule. The player separates the cards into guesses of admitted cards and repelled cards. The Visitor reveals the answer by removing the screen. If the rule is guessed, the game ends immediately. Nonstop Tabletop loved Visitor from Blackwood Grove! Our group loves reasoning games. We loved that there were different roles in this game so we each got to play our own part. There were SO many times that we wanted to burst our answers but had to be reminded that Aliens and Humans definitely do not speak the same language... so the table remained silent... with many hilarious facial expressions! We loved that there was more than 100 object cards so lots of replayability and room for creative rules. One things that was a bit frustrating to us, is that a win could be claimed with actually know the rule. As long as the player classified the objects correctly, they would win the game. It felt as though someone could steal the win without knowing all the facts. This however, did not detour us from loving this game! If your group enjoys puzzle inductive reasoning games, this is a must try!